Lebanon cedar in the garden seems to touch the clouds while the shimmering waters of Lake Iseo blend with the sky. You might be hours admiring the scenery from the window of the room listening to the sound of nature. A large apartment (90 square meters) with two bright bedrooms, a lounge with magazines, information, television and sofa, a kitchen with dishes, cutlery and cookware to prepare tasty dishes, a bathroom with shower overlooking the terrace and BBQ on the three garden-. A large garden its diversion! The apartment has a fire extinguisher and first aid kit. 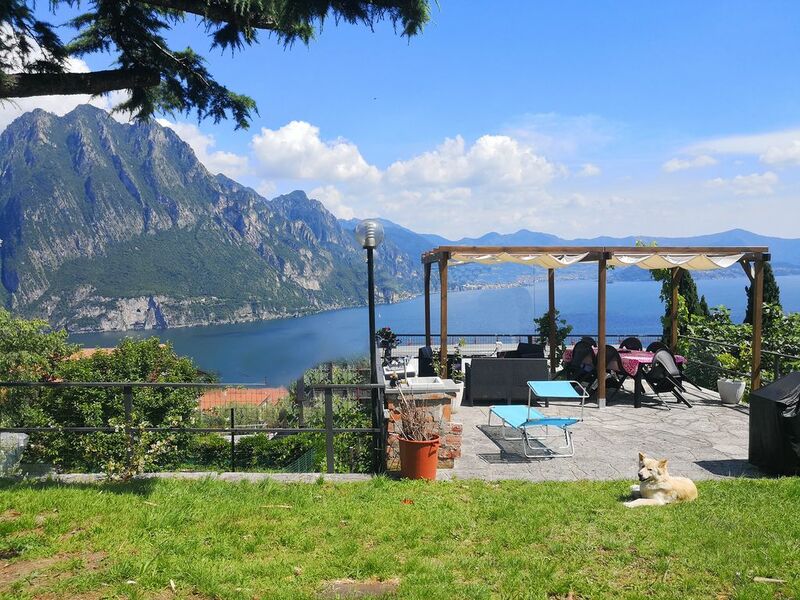 From the window of your apartment you have the most beautiful view of the lake of the entire house, you will have a private parking, you can walk to the center of Zorzino or down to the lake (we live about 2 km from the beach of Riva in a panoramic position) . You can relax in the garden, enjoy a barbecue on the terrace, read a good book on the deck, take a walk down to the lake or explore the surroundings by bicycle. During your stay ask us information, advice and tips on what to do or what to visit in the surrounding area or use the book of the traveler who will find in the living room to learn more about the area of ​​Lake Iseo .... and if you have doubts: we are at your disposal! Zorzino is a fraction of the town of Riva di Solto counts 860 inhabitants. A stone's throw from the apartment is a restaurant, and you can buy fresh bread or groceries at the general store in the center or at the butcher shop (500 meters). If you enjoy cycling you can try your hand in a matter of Lake Iseo (66 km) or just in the climb from Riva di Solto up towards Solto Collina. If you prefer the mountain bike road bike you can not help but go to the picturesque church of San Defendente. The easiest way to move around is by car, but if you love cycling, here you will find bread for your teeth. 2 km from the apartment you can go down to the lake to take one of the most picturesque streets of Northern Italy towards Lovere, including old galleries and charming views of the lake. You can also decide to climb up to Solto Collina, Esmate and the church of San Defendente (dirt) or the valley of the Cold and Lake Endine on asphalt. If you enjoy walking you can venture on the nature trail of Lake Iseo, a ring 17 km long by 410 meters in altitude. 2 km from the apartment, in Riva di Solto you can swim in the lake or eat an ice cream in the square. A Lovere (10 km) you can rent a kayak to explore Lake Iseo. We ask you not to smoke in the house but in the garden, not to make noise after midnight, to take care of the house as if it were your own, to ask us all the activities and the beauty of the lake and its surroundings. From 1 April 2018, in the municipality of Riva di Solto, the tourist tax of € 1 will be applied for each overnight stay. The fee will be requested until October 31st directly upon your arrival. The bathroom is with window, spacious and equipped with a large mirror, large shower, bidet, wc and two towels for each guest. Lake Iseo is an excellent destination for those who wish to combine the tranquility a bit 'of outdoor activities, from the bathroom to the lake to mountain biking, from sailing to climbing. If you need information about it, please do not hesitate to ask.